Xylitol Warning - Don’t Feed It To Your Pets! seek alternative choices for our foods and their ingredients. Choices today include Gluten Free (GF), Dairy Free (DF), Egg Free (EF), Soy Free (SF), Vegetarian, Vegan, and the list goes on. toothpaste. Do you really need a sweet tasting toothpaste? of greater availability. (You know, if it has to go through several chemical processes, somehow it just doesn’t sound natural to me, but that’s just my opinion.) At usda.gov, there are numerous articles concerning the production of Xylitol from various sources, including corn fiber treated with a resin to enhance the fermentation process. 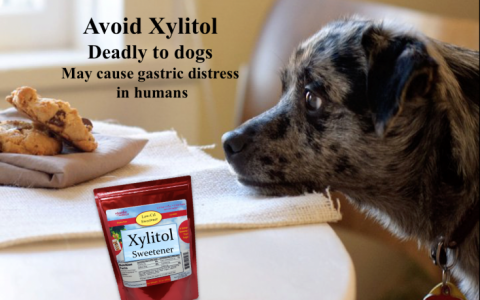 XYLITOL IS PROVEN TO KILL YOUR PET: Even small amounts, like in a stick of chewing gum, minutes after being ingested, and particularly in small breed dogs, can cause life threatening, acute low blood sugar. Please go to petpoisonhelpline.com to read their information on Xylitol poisoning. Symptoms of Xylitol poisoning include: lethargy, weakness or collapse, tremors, vomiting, seizures, jaundice and coma or death. All size dogs are susceptible to Xylitol, and larger ingestions can cause liver damage and necrosis (the death of most or all of the cells in an organ or tissue ). A complete list of symptoms is available at petpoisonhelpline.com, along with numerous articles regarding Xylitol. Even xylitol.org has issued a warning on their website regarding the poison hazard to dogs. Xylitol poisoning can happen very quickly, and depending on the amount ingested, fatal. We are all guilty of occasionally giving our dogs, and yes, cats too, a treat from the table. After all, who hasn’t laughed at Fido’s antics, licking a spoonful of peanut butter. It’s the treat that keeps on giving. Sometimes we do it without even thinking if it is okay for Fido or Meow-man to eat. Please, read the label before you purchase an item. You might be surprised what it contains. of these pieces and bits can easily spill, and the sweet smelling pieces entice Fido to swoop in for a deadly treat. BUYER BEWARE: Processed foods of all kinds are now using this sweetener. Bakeries are using it for their diabetic versions of low calorie, or sugar-free baked goods like muffins, cupcakes and cookies. It’s in low calorie peanut butters, and it can be found in our condiments as well. And it is also available in bulk in packaged granular form for home use. Before slipping Fido a tidbit from the table, check your ingredient listing for Xylitol. Even if it isn’t listed, check the “sugar-alcohol content” on the nutrition label if available. If it lists a sugar alcohol, please don’t give this item to your beloved pet. Xylitol could be lurking in this vague, obscure description. If you suspect your pet has eaten something containing Xylitol, seek medical attention immediately! Contact your veterinarian or call the Pet Poison Helpline at 855-764-7661.
prevention of tooth decay. Some sites also claim it can help control blood sugar, reduce weight and belly fat, fight yeast infections, increase collagen production, and maybe even reverse osteoporosis. Really? Sounds like one of those miracle elixirs the medicine man would peddle, doesn’t it? Hmm. Let’s get real, people. Just use cane sugar, or beet sugar, or honey, maple, or agave, and be a responsible adult by eating less of it. Then Fido can have a bite of your blueberry muffin. Ooo! Did someone say “apples and peanut butter?” Move over Fido!